We are a wife and husband team and dive buddies, passionate about scuba diving, traveling and environmental conservation. Feeling inspired by encounters with marine animals, our passion motivated the development of Scuba Calendar app. We feel that people protect what they know and love. Somebody said ‘adventure’? I’m in! Though cautious and methodological by nature, you will find it is easy to convince me to try out new sports or see new places. 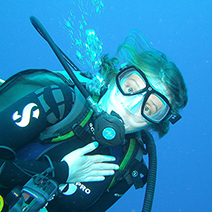 I have been scuba diving since I was a teenager - for 21 years now. 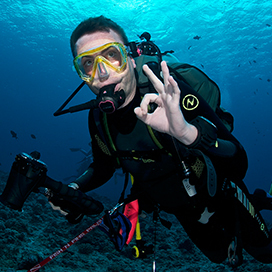 It was a different world when I did my first PADI Open Water Diver course. The rules were different, the scuba equipment was scarce, and the sea life was plentiful. Today, the equipment is plentiful and the sea life is scarce. When Katarina came up with the idea for this app, I felt like this could be it! This is how I could use my knowledge of IT project management and help us preserve the oceans for future generations. I wish this app would help our planet at least a little bit, so that you would be able to see the things I have seen when I started scuba diving.